What if Kidnapper's Neighbor Had Just Walked Away? 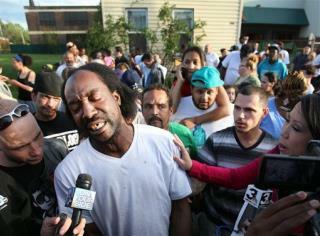 (Newser) – When Charles Ramsey heard a woman screaming and trying to escape a neighbor's home in Cleveland, "I figured it was a domestic violence dispute," he told a news station. It wasn't: It was Amanda Berry, kidnapped 10 years ago, and Ramsey helped her escape. But his initial assumption is telling, writes Amy Davidson in the New Yorker. "In many times and places, a line like that has been offered as an excuse for walking away, not for helping a woman break down your neighbor’s door. How many women have died as a result? They didn’t yesterday." What's more, Ramsey has said in interviews that he was friendly with the neighbor, having barbequed together in the past. What if he had ignored Berry and just told Ariel Castro later that someone was being loud? I mentioned this to realtruth below as well. Supposedly, according to the WTVC-TV NewsChannel 9 News facebook page, when asked about a reward he had this to say: "CLEVELAND HERO UPDATE: in Cleveland, Anderson Cooper asked if Charles Ramsey would like a reward for helping to rescue three women who had been held captive for years. Charles pulled his paycheck out of his pocket and said 'I get a paycheck. Give the reward to the girls they rescued.' " I have so much respect for this man right now.